The Doomsday Clock, by the Bulletin of the Atomic Scientists, constitutes a potent symbol of the danger we're in. When taking the 'minutes to midnight' from statements 1991 to 2018, an added trend points at Midnight by 2021. 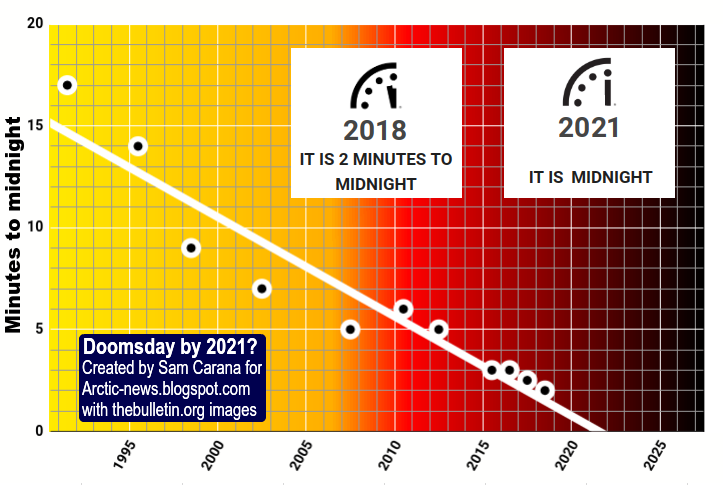 Will it be Doomsday by 2021? The 2018 Statement said that "world leaders failed to respond effectively to the looming threats of nuclear war and climate change. [ . . ] Global carbon dioxide emissions have not yet shown the beginnings of the sustained decline towards zero that must occur if ever greater warming is to be avoided." Recently, Fatih Birol, IEA Executive Director, said: "We expect energy-related CO2 emissions will increase once again in 2018 after growing in 2017." 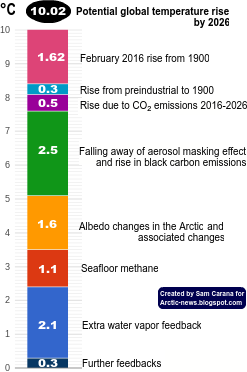 Next to carbon dioxide, the outlook for other greenhouse gases is also very worrying and the situation could deteriorate very rapidly, as further described below. Here's how. 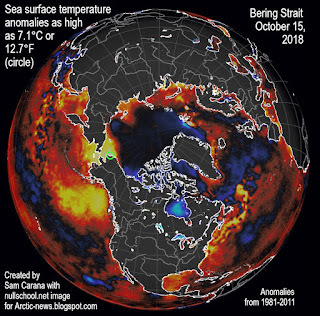 As above image shows, oceans continue to warm up, due to the rise in greenhouse gas levels in the atmosphere. 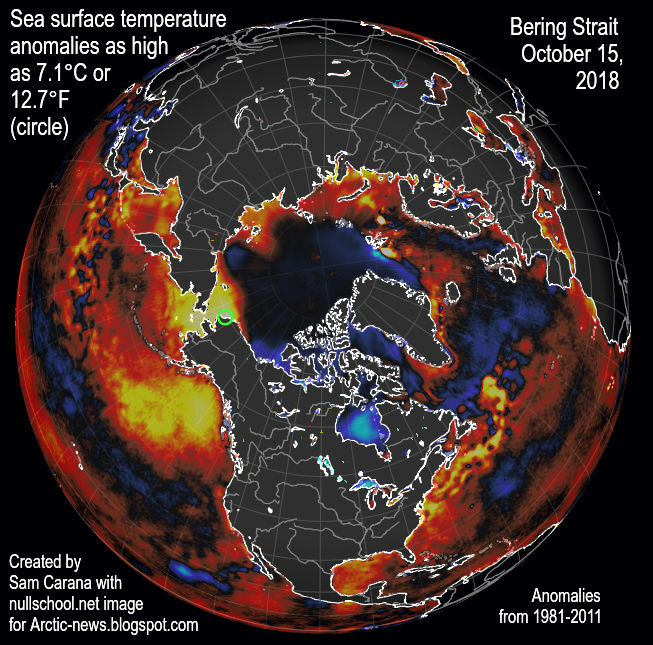 The image on the right shows sea surface temperature anomalies as high as as 7.1°C (or 12.7°F) in the Bering Strait (at the green circle) on October 15, 2018. 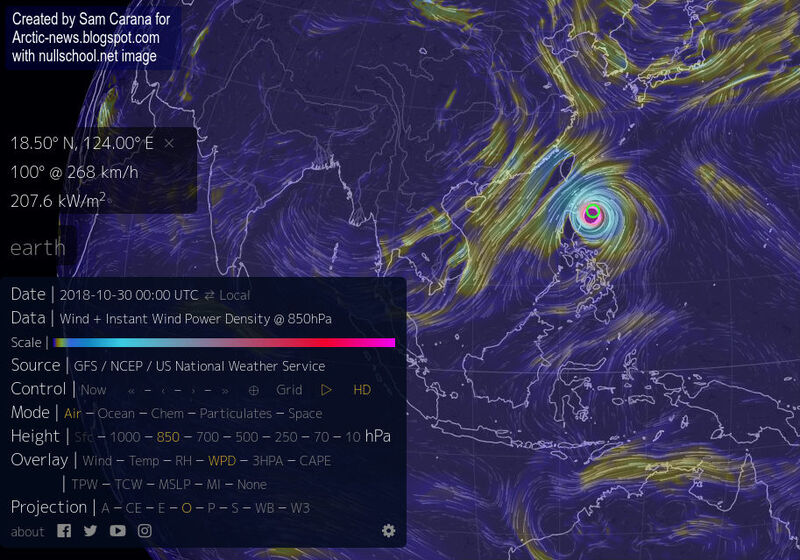 Warmer oceans result in stronger cyclones. The next image on the right shows that Typhoon Yutu was forecast to reach an Instantaneous Wind Power Density (WPD) as high as 207647 W/m² at 850 mb and wind speeds as fast as 268 km/h or 167 mph at the green circle, i.e. at 18.50° N, 124.00° E, on October 30, 2018, 00:00 UTC. Cyclones can suddenly push huge amounts of salty warm water into the Arctic Ocean. 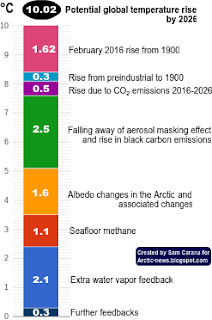 The danger is that a strong influx of salty warm water into the Arctic Ocean could trigger destabilization of hydrates in sediments, resulting in massive eruptions of methane from the seafloor of the Arctic Ocean, as described in earlier posts such as this one. This methane could cause temperatures to suddenly rise strongly at the higher latitudes of the Northern Hemisphere, speeding up decline of sea ice and permafrost, and further deforming the jet stream. This could trigger even more extreme weather events, in particular storms, flooding, heatwaves and fires, across the Northern Hemisphere that could devastate crops, take down power grids and threaten meltdowns of nuclear power plants. Such fires could add huge amounts of black carbon to the atmosphere. Furthermore, without access to fossil fuel and with the electricity grid down, many people could turn to kerosene lamps for lighting and burning wood for heating and cooking, resulting in even more black carbon emissions that have a huge immediate warming impact. James Hansen (2007) found the GWP for soot (BC) to be approximately 2000 for 20 years, approximately 500 for 100 years and approximately 200 for 500 years. Next to black carbon, there is another type of aerosols that is important, i.e. sulfur. 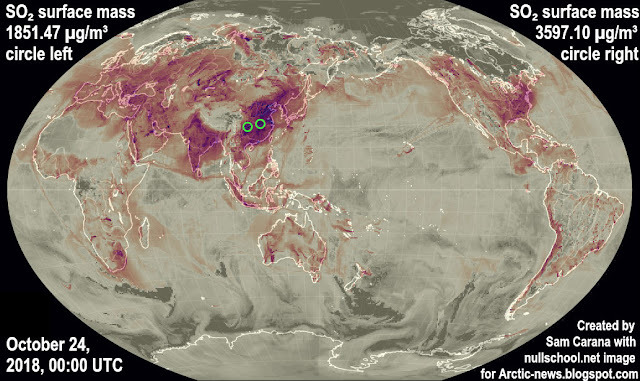 Above image shows sulfur dioxide levels as high as 3597.10 µg/m³ in East Asia on October 24, 2018, indicating that sulfur levels may still be rising. 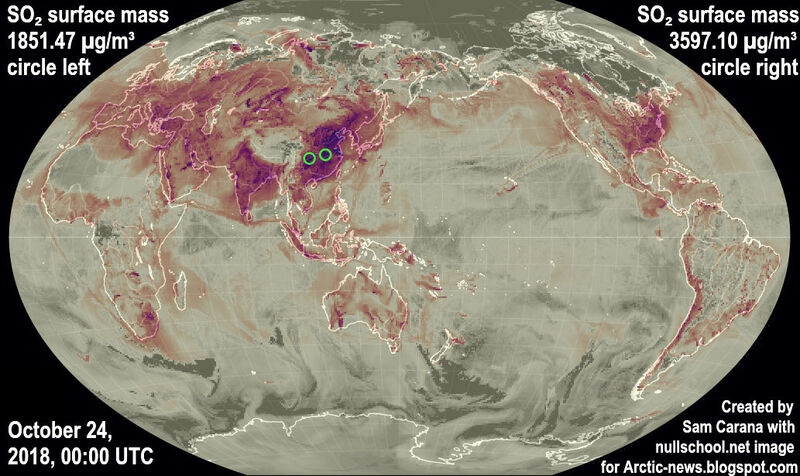 The image on the right shows IPCC (2000) projections for sulfur dioxide emissions. The aerosol masking effect associated with sulfur would be strongly reduced as industrial activity would come to a standstill, thus further driving up warming. The prospect of such a sequence of events makes a Doomsday-by-2021 warning appropriate. The accumulated impact of the various warming elements is illustrated by the image on the right.